The Tesla Model S keeps improving as well, and is on track to sell more than 10.000 units in Europe this year, an amazing performance of an EV in this price range. 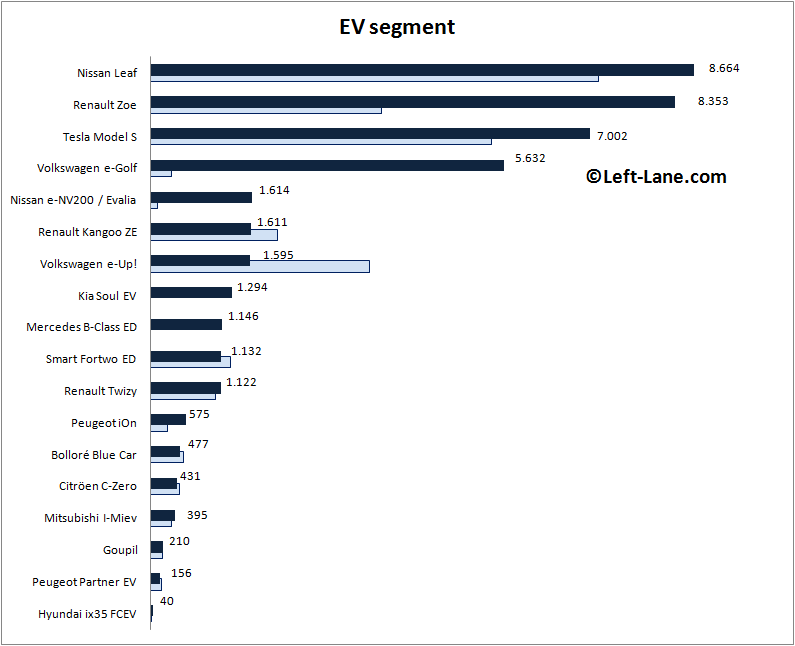 However, the Model S may not finish the year on the EV podium, as the Volkswagen e-Golf is winning a lot of popularity as well. Just 2% of all Golfs sold in Europe are equipped with an electric motor, but that still adds up to more than 5.600 sales for the e-Golf. The Nissan Leaf’s MPV cousin has proven a hit with environmentally conscious taxi companies, for example in Amsterdam, where more than 100 e-NV Evalia taxis make their daily rounds, replacing Volkswagen Caddy diesel taxis. As a result, the Evalia has passed the Renault Kangoo ZE, which is down 21%. The Volkswagen e-Up! loses more than half of its volume, while the Smart Fortwo Electric Drive is down 11%. The Kia Soul EV is the best selling newcomer, just ahead of the Mercedes-Benz B-Class Electric Drive, and at 18,7% the Soul also has the highest percentage of EV sales of all cars that are available with both internal combustion engines and zero emission powertrains. At the bottom of the ranking we find the Hyundai ix35 Fuel Cell Electric Vehicle, the car I reviewed earlier this year. With just 40 sales, it’s not a big player yet, but at least the Koreans have the honors of being the first to offer this technology in European roads. The Toyota Mirai will follow later this year. The PHEV segment is boosted by the arrival of no less than six all-new models, almost doubling the number of models available with a plug. This doesn’t hurt the segment leader Mitsbubishi Outlander PHEV at all, as its sales are up 52% as well, helped by increased incentives on plug-ins in various countries across Europe and the fact that it’s still the only affordable Plug-In SUV on the market. The Volkswagen Golf GTE is the best selling new PHEV and lands directly at #2 with over 6.600 sales, which is just 2,4% of all Golf sales in Europe, but better than the full-EV e-Golf. The BMW i3 is kicked down into third place. I get a lot of comments of why I’ve classified the i3 as a PHEV instead of a BEV, and my main reason is that most i3’s (no exact data available, please share if you know more) are equipped with the optional Range Extender, which makes it a PHEV. 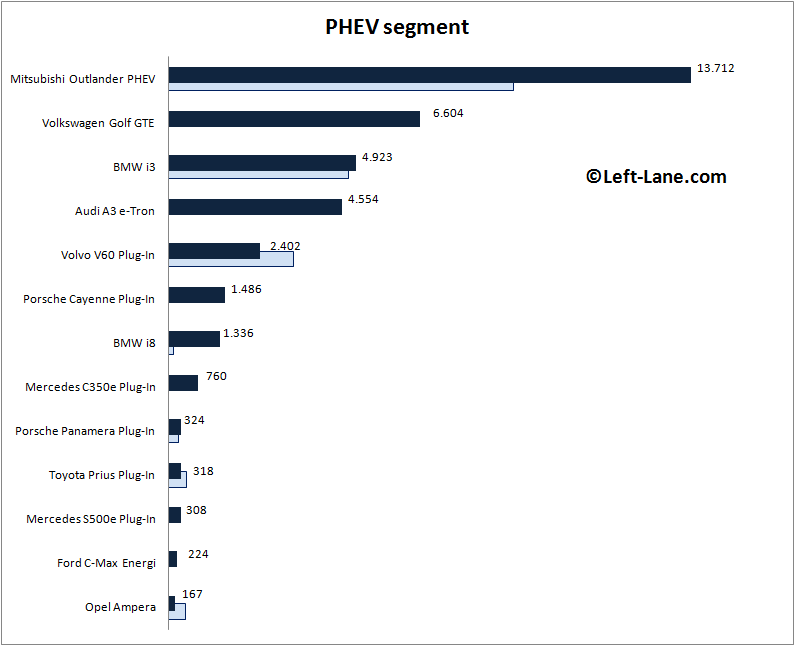 The Audi e-Tron, technically similar to the Golf GTE, reaches a fourth place and has a take rate of 4,2%, significantly more than that of its sibling. Sales of the Volvo V60 D6 AWD are down 27% as the model faces increased competition from Mercedes-Benz with the C350e. That model is said to have already been sold out for the rest of the year, and should be able to finish 2015 ahead of the V60. Volvo has also already sold out its XC90 T8 Plug-In hybrid SUV before it was even in dealerships, so that car should storm up the ranking quickly, depending on how many Volvo can produce this year. Porsche has impressive take rates on its Plug-In vehicles, with both the Cayenne SUV and the Panamera limousine at upwards of 14%. The relatively low additional investment and the greater improvements in fuel economy should be able to explain most of this success, and it’s promising for Porsche’s plans to launch a full-EV Tesla Model S rival in the near future.